Light bulbs have always been pretty inefficient, even those that have a rep for using less juice, like LEDs. Because of the energy conversion process, they consume more energy than they actually need to illuminate. But what if we told you that there was a light bulb out there, just waiting to be invented, that could produce more energy than it consumes? A group of researchers at MIT have figured out how to develop LED lights that wildly eclipse the efficiency of any other bulb. In fact, they successfully tested a LED light with an efficiency of 230 percent! The key to increasing the power conversion efficiency, according to MIT researcher Parthiban Santhanam and his co-authors, is to decrease the applied voltage. When the voltage is halved, the input power is decreased by a factor of four. (The inverse is also true — the brighter LED lights are, the less efficient they become.) 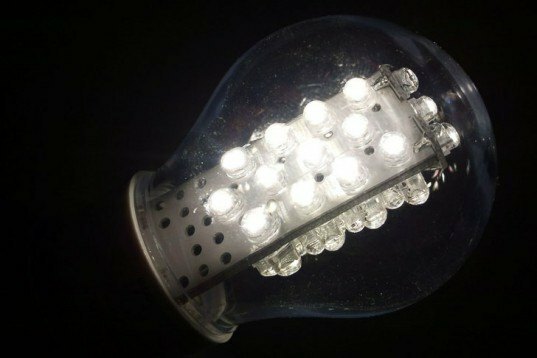 In effect, if you decrease the input power enough, the LED’s efficiency can increase to more than 100 percent, thus achieving what’s known as “unity efficiency.” When that happens, the light bulb will produce as much or more energy than it takes to power it, giving you the ultimate bang for your buck. The only problem? As you may have guessed, significantly lowering the input power creates a very weak LED bulb. In their tests, the MIT researchers succeeded in generating about 70 picowatts of light from 30 picowatts of energy — an efficiency of 230 percent! That’s a remarkable achievement, but still a miniscule amount of light. For now, there really isn’t any practical application for a super-efficient 70-picowatt bulb, but according to PhysOrg, the researchers hope the breakthrough could open the door to new advances in energy-efficiency electromagnetic communication. @Roger Bird This is not a scam. From what I know, this LEDs are more than 100% efficient because they are using electricity+environmental heat to produce light. That means that a large portion of the power being used comes directly from the environment. MIT must either acknowledge that this is a scam, or else they must apologize to Fleishmann and Pons. They may have re-discovered T. Henry Moray's over-unity transistor! wow. the idea that a light bulb could be made this efficient, no matter the size or function, is impressive. perhaps someday we will see ultra efficient LEDs that emit more light and can be used on a large scale. May I suggest another explanation. The mentioned (weak) input current could cause a molecular vibration that is in resonance with the thermaly caused vibration. If these two frequencies are in resonance then this should support the electron displacement in the LED. In that case we have an energetically open system where the ambient temperature is used as an external source of energy. If that is true then we are violating the second law of thermodynamics because we are creating negentropy from the entropic ambient heat. But that must not necessarily be the only effect that plays a role here. In past years there are observations that light at a certain frequency can hyper energize electrons via quantum dots in solar cells. These hyper energized electrons then bump into other electrons also displacing them. Thereby one photon can energize more than one electron. The energy for this energizing effect should not only come from the input light but from another source of energy. This other source of energy could be the quantum vacuum as explained below. 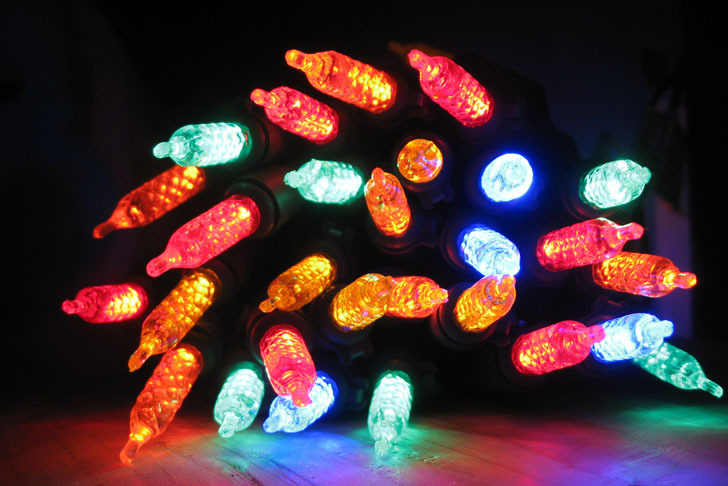 The electric field that is present in the LED is also a form of light. It is a known fact from QED that an electric field exists as a broken symmetry of the quantum vacuum. Such a broken symmetry is represented by a stream of steadily ongoing polarisation events of locally appearing virtual photons. Since these virtual photons appear into existence from the quantum vacuum (or space time) just like that and these virtual photons create the electromagnetic interaction then this means that the energy for the acceleration of an electron comes from the quantum vacuum as well. In the described LED it could be that not only the light from the thermal radiation but also from the electric field creates a resonating vibration in the semiconductor. This vibration could then hyper energize electrons in a way that is related to the energizing effect in quantum dots. In this case the electrostatic field would act as an external source of energy that uses the energy from the quantum vacuum to displace the electron and thereby create an excessive amount of light from the LED. The reason why this idea should be discussed is, that if we claim that we are using as an external source of energy the thermal radiation only then we have to measure with a very precize calorimetic measurement the „wasted“ ambient heat (cooling). I am not aware of such a measurement and I have doubts that a cooling of the LED exists. @ Caeman : Great Idea though, but, to tap that 'efficient' level of photo energy back via a photovoltaic cell demands even challenging technology; and if ever possible, we might have to cover up this 70 picowatt source totally with a solar panel.. Donno' if I am gettin' too pessimistic... May be some 'tweak' at the energy band level would be working better than this! No, then you have an energy surplus. Where is there motion, ignoring the movement of electrons. "A heated semiconductor light-emitting diode at low forward bias voltage V<kBT/q is shown to use electrical work to pump heat from the lattice to the photon field." So the extra energy is coming from ambient heat; nobody's claiming to violate conservation of energy here. Modern air-conditioners are also "over unity" efficient for the same reason. They are not making extra energy, just moving heat energy from one place to another using an amount of electrical energy that is less than the energy so moved. It's always good to keep a sharp eye out for perpetual motion claims, but the abstract of this paper should allay any fears of delusional thinking at MIT. OK, they either defined efficiency incorrectly or they mis-measured it. Energy efficiency (energy out/energy in) didn't go over unity, period. I didn't realize MIT had deteriorated this far. No perpetual motion machine is created here. The article failed to mention the real reason why the LED can exceed 100% efficiency. Here is why: It's nice research, but it's sort of "cheating" in an honest way. Efficiency mentioned here is how much electricity is converted into light by this LED. Let's say, you inject 10 electrons, and they turn into 8 photons which escaped the LED, so you get a 80% efficient LED. The 2 missing electrons are "wasted". So, in order to get to 100% efficiency and beyond, you find another way to make up for those 2 missing electrons. MIT team used the well-known thermoelectric effect which converts heat to electricity, which in return makes up for those "wasted" electrons. As a result, this LED has over 100% efficiency. You now see why they choose to do the experiment as very low voltage, because low voltage means less electrons injects, so fewer "wasted" electrons you need to make up. Therefore, the over 100% efficiency is kinda of "cheating" in an honest way. What's supplying this ultra low voltage LED electrons are not electricity alone, but also ambient temperature in form of thermo energy. The quoted efficiency in this article is a ratio between photon generated by TWO sources of energy and input from ONE source of energy. Of course, the efficiency can be much higher than 100%. It's that simple, but I do not in anyway wish to undermine the importance of this research. It's good work. I just don't wish others who does not have background on this specific topic to misunderstood the importance and message of this research work. Create a solar electric panel that can generate electricity from that 70-picowatts of light. If the solar panel can generate more than 30-picowatts of energy, we have invented perpetual motion! What about the law of conservation of mass? Doesn't apply to this research?